← What does Anthony Bourdain think of food bloggers? I WAS hungry, in a strange city and needed an Asian food hit quickly. Searching for a decent place that would fit this criteria in Perth’s CBD on a weekday took some time but as I turned into Pier Street I knew I was on to something when I saw a small Korean restaurant almost packed to the rafters (mostly with Koreans) before 6pm. This little restaurant (it seats about 26), is cramped and as people arrive I observed some table swapping so that pairs and groups could sit together. I was put onto a table for two right near the cash register (and the two women that were on that table as I entered were whisked away to a small table to the side). Service is very attentive and waiting staff have the amazing ability to be able to talk with a beaming smile despite the constant shuffling and squeezing between tables of both staff and diners. The menu arrived with a glass of water and after observing what others around me were eating, I decided to go for two servings of the gogee mool mandu steamed dumplings (2 dumplings at $4 per serve) and the jaeyuek bibimbab ($13) a spicy pork bibimbab served with an array of five banchan (side dishes) of kim chee, a variety of pickles and a chilli sauce. It was difficult to come to a decision, though. The menu is extensive with more than 60 dishes on offer. The main staples are a variety of Korean fried pancakes (packed with choices of vegetables, meats and seafood), sizzling barbecue plates or bibimbab, Korean thin or long style rice cakes, a variety of soups and noodle dishes, and finally – three different kinds of Korean ‘schnitzel’. The hand-made dumplings were crescent shaped with a thick dough encasing seasoned minced beef with shallots – perfect for a chilly evening and a nice starter. The bibimbab didn’t come in the traditional stone bowl (I did see some on other tables), but in a white ceramic bowl. It was presented perfectly – sitting on top of a mound of al-dente rice was the cooked and glistening marinated pork with slivers of carrot, blanched sprouts, shredded seaweed and sliced pickled cucumber arranged neatly around it. The meat was tender and covered in a tasty and thick marinade. It was slightly spicy but not as to over dominate the marinade’s rich flavours. But what was truly impressive was the array of banchan that came with the meal. The kim chee was perfect but my favourite side dish was a delicately preserved slivers of seaweed. It was obvious to me that Took Bae Kee was a favourite with Perth’s Korean community and why not? 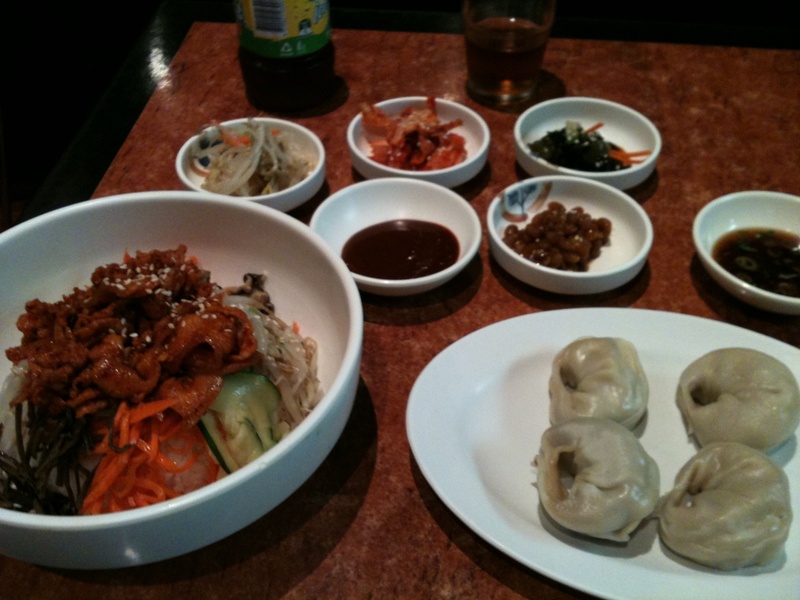 It offers a large variety of traditional Korean meals at very reasonable prices. If you choose to go (and you should), get in early – by the time I left (at about 6.45pm) people were queuing along the street to get in. The verdict: Fast and attentive service, traditional dishes serving mostly a dedicated Korean clientele. Well worth a visit. What: Took Bae Kee, Shop 6, 544 Hay Street, Perth (its actually just around the corner on Pier Street). Open: Seven days from 11am (to 2am on Fridays and Saturdays). Phone: (08) 9225-4557. There is also a Took Bae Kee II at 127 Barrack Street, Perth. Ate there: 23 April 2010. This entry was posted in Korean, Perth, Western Australia and tagged Australia, Food, Korean, Perth, Restaurant, street food, Took Bae Kee. Bookmark the permalink.